SERC Chennai Job Opening 2018-2019 Application Form for 05 Technical Assistant, Senior Technical Officer Posts Apply Online through Official website www.serc.res.in. Structural Engineering Research Centre Jobs The last date for submission of Online applications is 09.04.2018. SERC Chennai pattern of examination, Syllabus, Question Paper, Admit Date Release Date, SERC Chennai Exam Date, SERC Chennai Result Date etc. Technical Assistant - First class Diploma in Electrical Engineering/ Electronics Engineering/ Instrumentation Engineering/ Electrical & Electronics Engineering/ Technology of 3 years full time duration or atleast 2 years full time duration in case of lateral admission in Diploma courses or its equivalent with experience of 2 years in the relevant area /field. Senior Technical Officer - BE / B.Tech. in Electronics & Instrumentation 55% marks with experience of 2 years in the relevant area/field. 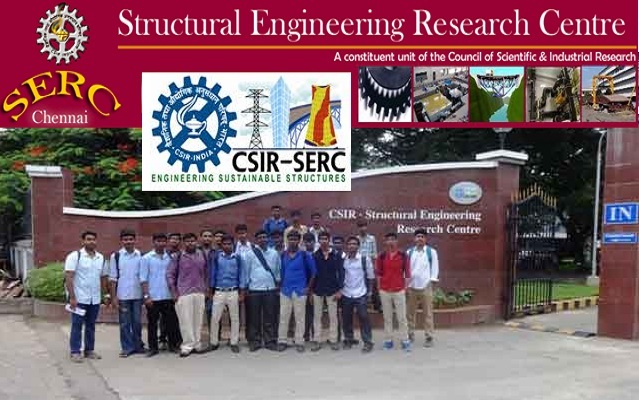 Hard Copies of the signed application (registered online) along with photocopies of (i) ID proof (ii) Proof of Date of Birth (iii) Educational Certificates: Mark-Sheets/Degree Certificate (iv) Caste and attested copies of relevant documents should be addressed to “Administration Officer, CSIR-Structural Engineering Research Centre, CSIR Campus, Post Bag No.8287, CSIR Road, Taramani P.O. Chennai 600 113” by post so as to reach us by 23.04.2018.